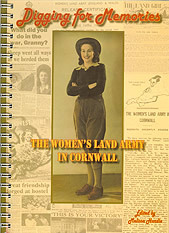 The 'Forgotten Army' or Women's Land Army recruited women from all over the country during the Second World War. They took part in farm jobs and grew vegetables so that the people of Britain did not starve. 'Digging For Memories' is a collection of memories of those hard working women who left their homes and families to take over the men's work. The book is packed with copies of original photos and documents and gives a true window into the lives of these vibrant eighteen year olds. Angie takes the book and the land girls into schools to add first hand experiences to the pupils knowledge.